If your aim is to give your guests and clients a feeling of amazement they will never forget, Magician Matt is the one that will take your event to the next level. Matt is a professional close up magician, a rare breed of magician focusing on fresh, cool and stunning magic. His magic career began at the age of 18. He specialises in coin, card and mental miracles, some of which have never been seen before! He has spent over 10 years creating breathe taking close up illusions. His performance and energy style means you are guaranteed a to experience a performance like no other. Magician Matt has performed at hundreds of UK functions and was showcased in the international media, including BBC TV and The Sun. Matt’s close up magic is an art form that your clients will love and they will remember your company for all the right reasons. He has been hired for numerous large scale London based companies. Matt can represent you in a unique way using incredible bespoke magic and contagious charm. He is often booked to entertain at corporate events, weddings and parties all over the UK and Internationally. 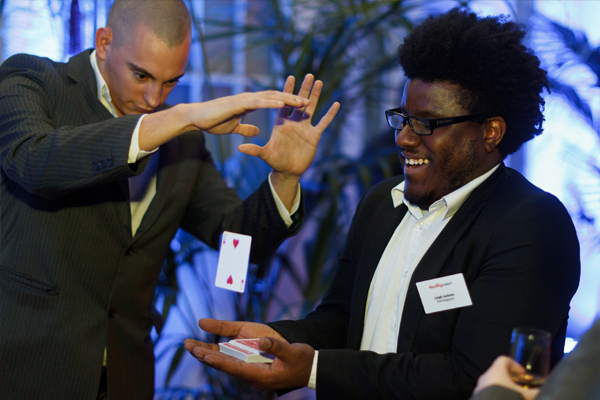 Matt will provide unbelievable magic during your event that guests will remember for the rest of their lives. Add something incredible to your party with this incredible magic. The close up magic provided is of the highest level. An award winning show full of wonder, creativity and laughs, that will leave your guests stunned. He has worked with big companies across the world including Spotify, Cosmopolitan and Samsung. Matt’s performances are breathtaking. You will witness magic that creates amazement and a feeling of joy. iPad magic has taken the entertainment scene by storm. Matt can produce real life objects from an iPad or turn everyday items into digital imagery just by pushing them into the iPad screen.